Radiofrequency treatment delivers heat to the deeper layers of the skin while cooling the epidermis. This coagulates protein and results in a drastically smoother skin surface. Once coagulated protein stimulates new collagen synthesis to maintain the therapeutic effect over a considerable period of time. So the skin becomes tighter and more elastic from this procedure. Pneumatic radiofrequency therapy using a suction device reduces deep nasolabial folds by pulling the depressed tissues upward. Pulling the skin to the posterior auricular direction brings a three-dimensional lifting effect similar to that of a face lift. This method has received a positive review on journal of Dermatologic Surgery. It also tightens pores by delivering focused heat energy. Fractional laser irradiates laser beams in spots over one fifth of the skin surface. The therapeutic effect of fractional laser is based on the heat column effect of laser irradiation. There are two techniques to fractional laser; the nonablative method using Er:glass laser and ablative method using CO₂ laser. A grid of tiny crusts form for 3-4 days and quickly disappear. It can be used in combination with radiofrequency therapy. Fractional laser is effective in anti-aging, as well as scar removal and striae distensae treatment. Also known as HIFU-KNIFE, high-intensity focused ultrasound has been used in treatment of prostate cancer and breast cancer since the 1990s. The key advantage of this technique is that it can deliver heat energy to the muscle layer and fascia and affect the target layer of the dermis and fascia directly without invasive surgery. 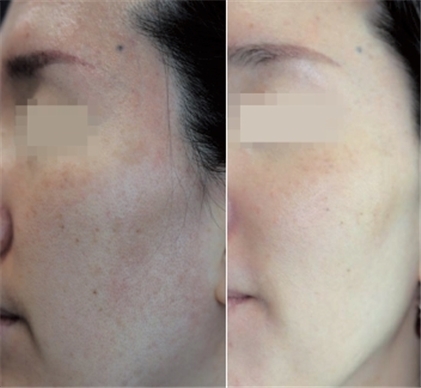 Whereas radiofrequency treatment improved collagen in the dermis, HIFU treats the cause of sagging skin fundamentally by delivering energy directly to the fascia. In its mechanism of action, heat columns of high intensity ultrasound are discharged to reach the depth of 3-4.5mm into the skin. Thermocoagulation is created at the focused zone and immediate tightening and wound healing effects occur in response to the heat. During the wound healing process, cytokines are released to promote the synthesis and the regeneration of collagen, thereby improving wrinkles and sagging skin. Enhanced effect can be obtained with the dual-plane method that delivers heat to two depth levels of 4.5mm and 3mm or combination with other superficial radiofrequency devices. As collagen regeneration takes about 30-90 days in general, superior effect can be seen at the 90 days after the procedure rather than immediately. Middle-aged to elderly patients whose drooping eyelids hinder vision can be effectively treated by HIFU without upper eyelid blepharoplasty. Moreover, younger asian patients who have lateral eyebrow descent can be relieved with this non-invasive treatment (Figure 2). 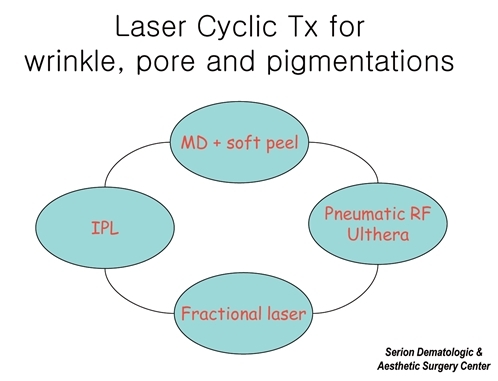 Cyclic therapy refers that combining treatments above mentioned various modalities sequentially improve multiple skin aging signs including pores, wrinkles, pigmentations and age spots, etc simultaneously. 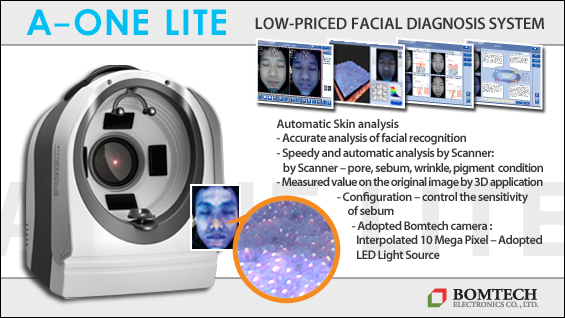 Compared to repetitive procedures with a single laser, this strategy minimizes the varied response according to individual patients. By using various lasers with different mechanism of action and target areas, it can comprehensively treat a wide range of aging problems. Moreover, it can also reduce the tedium as well as side effects with using a single laser(Figure 3, 4).